Karyn consistently delivers high-quality graphic design for our promotional event materials and consumer education programs. She meets every deadline, keeps the creativity flowing, and always brings new and exciting design concepts to the table. With nearly 15 years of experience under her belt, I know I can always count on her to present thoughtful, clever, and inventive designs to make our marketing and communications deliverables look impressive. Yondee Designs has revolutionized the look of our Association. We began as conservative and clinical, but since working with Karyn, our publications and printed materials look edgier and professional. We’ve even won awards for our printed materials - thanks to Yondee Designs. I know I can call Karyn, explain what I am looking for, and get several ideas to choose from in a short period of time. Her eye for good design that meets my needs and helps communicate to my target audience is a great asset to have in a designer. Most importantly, Karyn is a pleasure to work with and her customer service is first-class. Every time I talk with her I feel like I'm the most important client she has, and that I'll get everything I need—and then some. 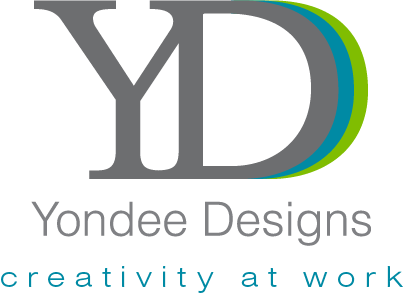 Yondee Designs is my go-to agency for all my graphic design work. Yondee Designs understands that one design does not fit all places. Karyn has done an amazing job of understanding our School and creating pieces that reflect our values and personality. We have seen an increase of in response since Yondee Designs has started working on our Annual Funds mail pieces. Karyn has become indispensable to our association with her ability to quickly and beautifully deliver the look we need for our convention literature, often when we give her very little to go on. She works magic with our convention information to give our events the professional look we need. She has been a hero under sometimes very tight deadlines, and with our small staff it is essential to have a partner we can rely on to pull off the miracles she has worked again and again! Yondee Designs was referred to me from the Printer that I use. Working with Karyn has been the best! She offers fair pricing and brings genuine creativity to the table while keeping in mind time sensitive schedules. She's also offers quality customer service & communication which is a MUST in my book! Working with Yondee Designs has been one of the biggest decisions that we have made, that I feel has helped to make my life and business run smoother! Thank you Karyn! Yondee Designs flair and skill are depicted brilliantly in Guernsey's new catalog cover design. Our company image is visible and imaginative. We are especially pleased at how quickly Karyn responded to our alterations and updates. Our group has many different opinions and Karyn showed such patience and understanding when dealing with us. The time, commitment, and enthusiasm in helping us achieve our desired "look" completely exceeded our expectations. We look forward to continuing our relationship!